The Little House Cookbook: Frontier Foods from Laura Ingalls Wilder's Classic Stories is simply amazing. 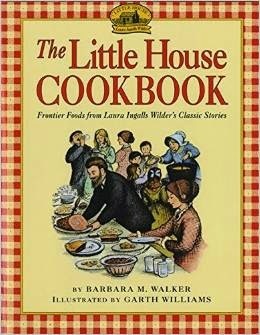 Barbara M. Walker brings the entire Little House series to life with this 240-page collection of authentic pioneer recipes, Little House excerpts, and historical text. Fans of Little House will want to add this to their collection. Throughout all of the Little House books, Laura Ingalls Wilder wrote of pioneer foods, often in detail. Food was social. Food was work. Food was life. Laura not only described what was eaten, she also explained how it was prepared and stored. Many of the foods named and described in the Little House books are unfamiliar to modern readers. The Little House Cookbook, published in 1979, provides readers the unique opportunity to understand and experience pioneer cooking as Laura may have. In the foreword, Barbara explained her efforts to use authentic recipes described in the Little House books though some compromises must be made for modern cookware and such. I delighted in reading The Little House Cookbook. The eight chapters include titles such as "Staples from the Country Store" and "Foods from the Woods, Wilds, and Waters." Each chapter begins with several pages of historical context and information related to the chapter topic. Next, the recipes begin. Accompanying most recipes is a quote from a book (or two) followed by commentary and then the recipe. It is important to note that while Barbara prepared all of these recipes for her family, they are close to authentic. The Ingalls family ate for nourishment and not always for flavor. Some of the ingredients, such as rabbits and starlings, may be a bit difficult to find. Other recipes can be made with items you already have on hand. I am a fairly experienced cook (from scratch-but without lard) but some terms used in the recipes made me appreciate the glossary. This is a book to be enjoyed with children, but not a child's cookbook. I intend to make a few recipes from The Little House Cookbook, but I cherish this book as it adds depth and understanding to the life of Laura Ingalls Wilder and her books. Barbara Walker's research and labor of love shine in The Little House Cookbook: Frontier Foods from Laura Ingalls Wilder's Classic Stories, available in both hardcover and paperback. I highly recommend it. Thank you, Barbara, for sending me a copy of The Little House Cookbook.